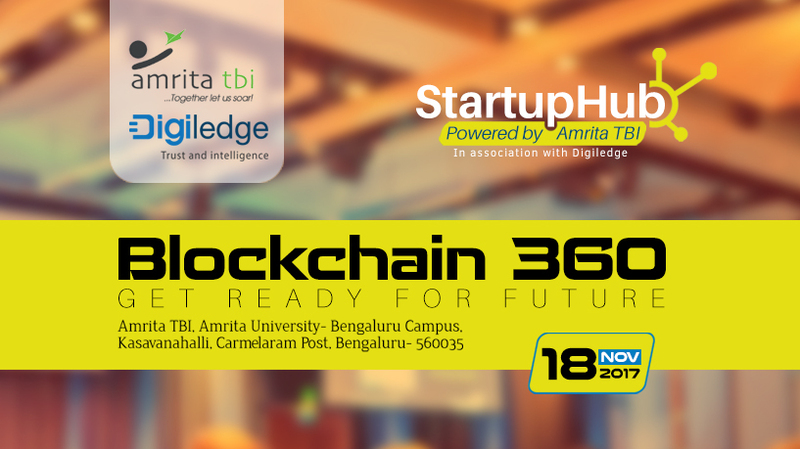 Amrita TBI in association with Digiledge organized Blockchain 360 Workshop as a part of its StartupHub events on 18th November 2017 at Amrita Vishwa Vidyapeetham, Bengaluru Campus. Blockchain is a technology that is about to radically transform how humans and machines engage in economic activity, forever. While humans have been using formal institutions to reduce uncertainty in trade since the dawn of time, Blockchain is evolving this age-old model into something far more interesting: the distributed autonomous institution. Amrita TBI incubates two startups involved in Blockchain technology and through Blockchain 360 workshop aims to transform participants into early adopters of the Technology. The event was enlightening with the presence of the experts in the Blockchain Technology. Dr. Dilip Krishnaswamy, the Senior Research Scientist at the IBM Research Labs introduced the applications of the blockchain technology in his keynote. Shri Rama Warrier, management consultant and former managing partner of Infosys Consulting addressed the business opportunities of the technology. Shri Mahesh Govind, CEO of Digilege, a blockchain based startup, co-organizer of the event and an incubatee at Amrita TBI, handled the technical session and detailed on Ethereum Vs Hyperledger programming models. Shri Shrivatssan MC, Founder, and CEO of Gemicorn discussed the business transformation through Blockchain Technology. Smt Radha Vasu, a consultant with Ernst & Young joined the other speakers for a Panel Discussion on Blockchain- Concept, and Practice, chaired by Shri Rama Warrier.. The event had active participation from the industry and academia and it witnessed the formation of Blockchain Club India, an informal group of Blockchain enthusiasts and experts. An attendee’s take on the workshop is available in https://medium.com/hashtaagco/blockchain-say-what-8e16ed29e543. StartupHub is a series of events organized by Amrita TBI supported by NSTEDB, DST - Govt of India, and NITI Aayog, primarily designed to build a network among the startups, budding entrepreneurs, student community, investors, industry experts, and mentors. Participants can explore opportunities availed through Amrita TBI and its world-class network of mentors and investors. Amrita TBI is a nonprofit startup incubator supported by Govt. of India and Amrita University. We fund, mentor and nurture ideas, startups, and entrepreneurs. In 2017, Amrita TBI received the National Award for being the Best Technology Business Incubator in the country.